"SEQUINED ATTIRE" is an outstanding Chestnut Sabino Thoroughbred filly that is double registered with the American Paint Association and the Jockey Club. 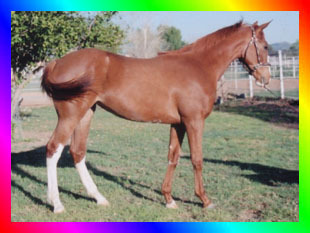 She is by "Racey Remarque"and out of "Stun N Sequins" (a "SECRETARIAT" Granddaughter). "Attire" was born 4-1-2002. She has TREMENDOUS speed and a show pedigree. 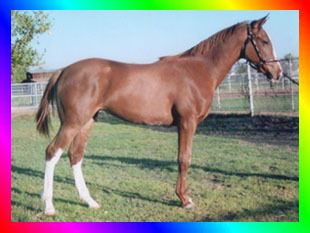 "I WAS FRAMED" is an oustanding race and stallion prospect out of "DANCE SPOT", by "RACEY REMARQUE". He carries the rare frame gene and is homozygous for the sabino gene. 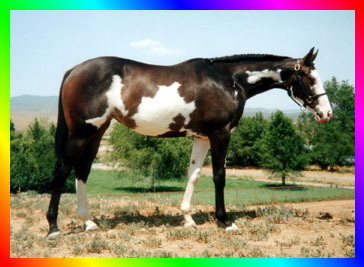 He is double registered with both The Jockey Club and The American Paint Horse Association. This spectacular colt is SOLD. CONRATULATIONS TO MELANIE GIBBENS of MALPAS STUD in England on your purchase of "I WAS FRAMED". "QUIT STARRING"! This INCREDIBLE filly is by "Racey Remarque" and out of "She's Got A Look". She is Homozygous for the Sabino Gene and has the RARE Frame Gene. She is double registered with The Jockey Club and The American Paint Horse Association, and will make her debut in the PAINT show ring soon. 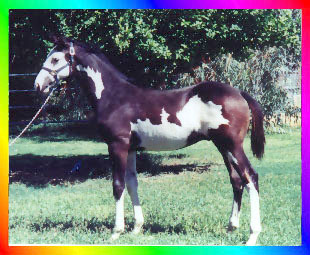 This fantastic filly is what we all dream of when breeding for overo thoroughbreds. They simply don't get any better than this!!!!!!! 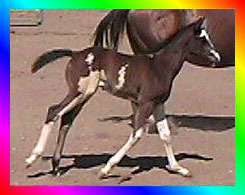 This spectacular filly was bred by COLORWORLD and SOLD. TO Dr. CAROLYNN LEE, congratulations on your purchase of "QUIT STARRING". BEST OF LUCK IN THE PAINT SHOW RING!! !